A redundant array of independent disks (RAID) protects against the failure of a single drive and provides improved performance and fast transfer rates by storing data across multiple disks. Disk striping refers to dividing data into blocks and writing the blocks across several storage devices. Disk mirroring refers to duplicating data on two or more disks. Parity bit calculates the data in two drives and stores the results on a third drive for the purpose of providing fault tolerance. RAID 5, with disk striping and parity, is ideal for use as a file storage server or application server. This choice for Mac users requires a minimum of three disks and provides fault tolerance and good performance. RAID 5 is a cost-effective option that provides good performance and redundancy in high-read environments. RAID 5 is a striping RAID level designed to increase the speed of disk reads and writes. Many Mac users opt for RAID 5 for multimedia file storage. Its read speed can be very fast, while the write speed is slightly slower, due to the need to calculate and distribute the parity. RAID 5 excels at storing large files, where data is read sequentially. Smaller, randomly accessed files have mediocre read performance, and write performance can be poor due to the need to recalculate and rewrite the parity data for each write operation. 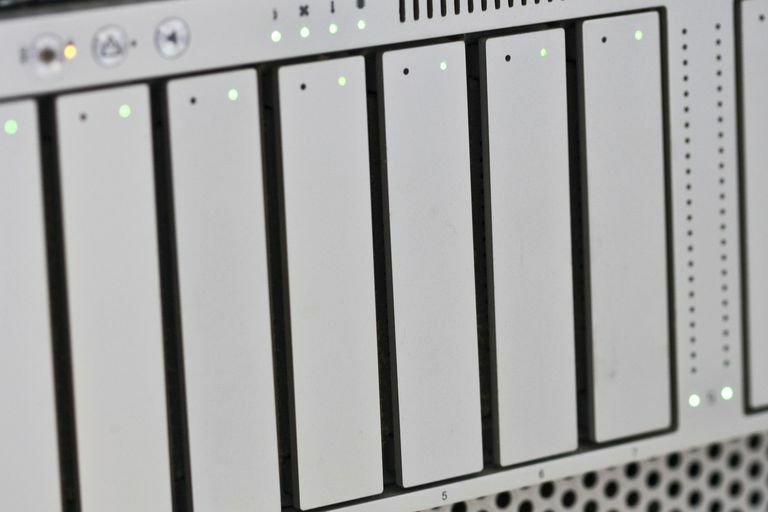 Although RAID 5 can be implemented with mixed disk sizes, that isn't considered the preferred approach since the RAID 5 array size is defined by the smallest disk in the set. The d is the smallest disk size in the array, and n is the number of disks that make up the array. RAID 5 is similar to RAID 3 in that it uses a parity bit to ensure data integrity. However, unlike RAID 3, which uses a disk dedicated to storing the parity, RAID 5 distributes the parity to all drives in the array. RAID 5 provides for drive failure tolerance, allowing any single drive in the array to fail without losing any data in the array. When a drive fails, the RAID 5 array can still be used to read or write data. Once the failed drive is replaced, the RAID 5 array enters a data recovery mode, where the parity data in the array is used to rebuild the missing data on the newly installed drive. Due to the need to perform parity calculations and distribute the resulting calculation, RAID 5 is best when operating in hardware-based RAID enclosures. There are two types of RAID arrays: hardware and software. At first, all RAID arrays were hardware-based, but their popularity declined, and most RAID arrays are software-based now. The Disk Utility app included with OS X doesn't support creating software-based RAID 5 arrays. However, SoftRAID, from third-party developer SoftRAID, Inc., can be used if a software-based solution is needed. Can a Multi-Bay Enclosure Meet Your Needs for External RAID Storage? What is RAID 10, And Should I Consider Using it with my Mac?